his, Scotland's sixth biggest loch, covers six and half thousand acres in its 14 miles between Kenmore and Killin. For thousands of years this water was a critical link on the main highway east and west across the centre of Scotland. Roads did not exist. Everything was moved on the back of a pack pony - or by water. Early man used dugout canoes. Later rowing boats and sailing craft ferried men and beasts over the loch and its surface was dotted with fishing boats chasing the teeming salmon and trout. In the 19th century the Loch Tay Steam Boat company was set up to link Loch Tayside with the Oban - Callendar railway allowing the export of livestock and the import of coal and lime to sweeten these upland soils. The last steam boat was broken up in 1950 and the dozen or so jetties which once bustled with activity have rotted away. Now the loch is at its quietest and most tranquil since history began. The loch has frozen over only twice in recorded history - in 1771 and 1785. On that last occasion two men crossed the ice, taking the precaution of pushing a boat ahead of them. Its east-west axis means that storms coming in from the Atlantic can whip up high waves. There is an inch a year less rain for every mile between Killin and Aberfeldy. On a calm day in 1784, the natives were alarmed to see the waters at the east end of the loch drain backwards, emptying the bay at Kenmore and making the river flow back into the loch. Then the water came rushing back in a great wave and continued to slop back and forwards for several hours. Just over the hill is the geological fault line at Comrie which, although quiet for the last half century, used to regularly rattle windows and the agitation of the water was probably connected with this although at the time the tremor was believed to emanate from a string of earthquakes that hit Portugal. Throughout prehistory the Tay was far more important as a thoroughfare than any path or track. In Loch Tay as on scores of other lochs throughout the country people built round, reed-thatched habitations on stilts out in the water. Rebuilt on the same spot time and again - some right up into the sixteenth century - many now appear as little islands in our lochs. Loch Tay had eighteen such crannogs. Archeology on land is often the study of imperishable material - pot shards, stones, and non-ferrous metal. The mud and water of the loch has preserved much more - textiles, foodstuffs, wooden boats and implements. From these a picture of the way of life of some of these prehistoric people of the Highlands can be understood as never before. The crannogs were used to house livestock, mainly sheep, as well as their owners. A wooden causeway led to them from shore which would have been barred at night to keep out wolves. These were a serious hazard, considered more of a pest than thieves. In the seventeenth century the last Perthshire wolf was said to have been killed by a Mrs Robertson who bopped it on the head with a wooden potato masher when it entered her cottage to investigate the cooking pot over her fire. Mullinavadie - the Wolf's Mill - just north of Dunalastair in Strathtummel marks the spot. The crannog dwellers were peaceful, pastoral people whose houses could not have been surpassed for airy comfort in summer and can provide a snug haven in winter. Floating above the loch, their sanitary arrangements would not be improved upon for two millennia. 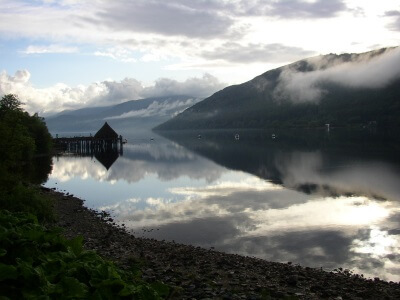 The purpose of the magnificent crannog built at Croft na Caber is to raise money so that the excavations in Loch Tay can continue to multiply the amount known about these early peoples. The largest crannog on the loch, the Isle of the Tay by Kenmore, has a causeway just beneath the surface of the water leading to the north shore. Alexander I is said to have built a lodge on it for use when he came for the salmon fishing and in 1122 his queen Sybilla died and was buried there. The king gave it to the abbey at Scone as a priory and the monks eventually handed it over to nuns who used it until the Reformation. Once a year the nuns left their island to visit the market at Kenmore. They landed at Portbane, the port of the women, alongside Croft na Caber. Although the island is near the opposite shore, the river was unbridged and required a ferry to cross it. Port Bane meant a single boat trip rather than two, although the nuns were faced with a longer walk to Kenmore. When the Campbells arrived they had to mark time for a generation or two before they grabbed Taymouth so they built their first house on this island. Montrose attacked it on his way by and was repulsed. Cromwellian soldiers captured and destroyed it as they did to every other castle in the area that they were not using as a garrison. Kenmore was built to house the tradesmen and estate workers who served the castle. The bridge was thrown across the river in 1774. £1000 was given towards the cost by the Commissioners of the Forfeited Estates.